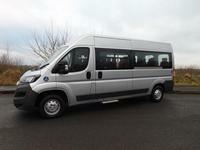 New Peugeot Boxer CanDrive Flexi 17 seat minibus available in many colours to incliude white, blue, red, metallic silver, black or burgundy red. Convenience items include heated and electric 4-way door mirrors, electric windows, glazed heated rear doors, central locking, Bluetooth and DAB radio with USB input. Fully glazed rear saloon with 2 vented, slide opening windows. All rear windows are fitted with kite marked safety glass. 14 x M2 tested/certified rear saloon seats, fitted with 3 point adjustable seat belts suitable for all ages, finished in Dark Grey trim to match the driver and front passenger seat. Side step below sliding side door, along with our twin full-height handrail system and courtesy panel, to aid embarking and disembarking. Call today, we have a range of new and used 17 seat B licence Minibuses in stock and ready to go, or we can build a bus to your exact requirements.